Licensed facilities may be required to periodically test emissions (also known as Stack Testing or Emissions Testing) from their equipment. 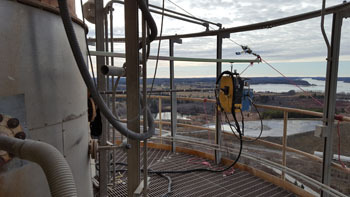 Additionally, facilities with continuous emissions monitoring equipment must perform Relative Accuracy Test Audits (RATA) to demonstrate the emissions monitoring equipment is operating correctly. Below is information on submitting the required test protocols and final reports to the Department. Both protocols and final reports may be submitted electronically by emailing to StackTestDEP@maine.gov. Please note: Our system has a limit on incoming email of 20 MB. If your file exceeds this limit, the file must be split and sent in two or more separate emails. Otherwise, it won’t be delivered to the intended recipient. For Fed-Ex or UPS, the physical address is 25 Tyson Drive. For more information, contact Robert Hartley (207) 287-7644.